Looking to throw a special event for family and friends in the Plano community? Bounce houses are great for any kind of function: back-to-school bashes, bar mitzvahs, birthday parties, church picnics, reunions and more. Boys and girls in the Plano area can enjoy a variety of amusement. A child and their imagination is the perfect set up for any bounce house available at Jump City Dallas. A variety of inflatables that fit’s anyone’s liking. 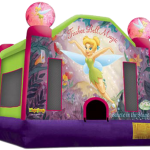 Children can have hours of fun in an assortment of themed bounce inflatables including combo units. Whether it be bouncing up the walls like Spider-man or flying up, up and away like Tinker Bell, the imagination can run wild. 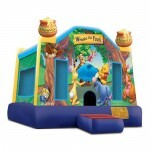 These safe and affordable bounce houses will leave your child and their friends full of fun and laughter. While living in Texas we all know how hot this great state can get, especially trying to beat the heat. A variety of waterslides and combos units are the perfect setup to keep cool this summer. As many parents may know getting your child ready for back to school can be a big ordeal, but with the help of our water slides it could be a fantastic way to encourage them back in. Kiddos can try the huge 16ft water slide towering over your home where they can slide down enjoying the big slash at the end of the slide. Or they can even try the Big Kahuna guaranteed to make all sorts of waves in the backyard and the best part is that you can beat the lines at any water park with the convenience of your very own home. Do you have an older child at home? One’s that maybe find bounce houses to be for their little brother or sister? With our huge variety we offer many combo units and dry slides. The “big” kids can experience mixture of courses. Kids can get their adrenaline pumping from the Adrenaline Rush Obstacle Course. For the more adventurous children, they can try the 40ft or 60ft obstacle course racing in and out of tunnels and tubes. 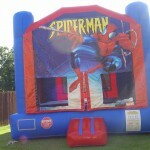 With this big selection of bounce houses and water slides, Plano residence can now throw a fantastic party. They will have your little jumping bean can jump up, up and away for just one day full of hours of fun. So make sure to check out this assortment of entertainment before they run out.